Public screw up, public apology. I’ve been out of town for a couple of days (roughly 5 pm Tuesday to 11:40pm Thursday) for some medical screening and evaluations for one of my kids (long story, not that relevant, but if you’re super curious, feel free to check out The Backup Kidney blog). 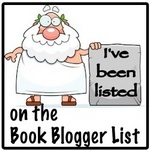 To help keep things alive during that time, I signed up for a couple of Book Tours — posts that are pretty much prepared by someone else, and can be scheduled well ahead of time. One of those was for the entertaining read, One by One by Robert Germaux, as put together by Susan Barton. Those posts went up Thursday, technically yesterday now. Monday while packing, I finished putting those together, got them scheduled to post and checked another item off my pre-trip To Do list, and thought no more about them. They looked fine, everything worked in Preview mode. Then this morning, somewhere between a chest X-Ray and an echocardiogram (I’m not exactly sure when), I got an email from Ms. Barton that things weren’t looking right — no images were showing up — and could I please fix that. Well, no, I was on a spotty and slow connection with only my phone — I really couldn’t even get a reply composed given all that was going on. I was 400+ miles and 13-14 hours away from being able to sit down and fix things. I don’t know what happened, again, it all looked good Monday night. I didn’t bother to troubleshoot — I just uploaded the files with different names and changed the coding on the posts. I believe things are displaying correctly now. I sure hope so. If not, I’ll try again as soon as I get home from work tomorrow — and then, I don’t know, try self-immolation. I’ve given the explanation, now the apology — I’m very sorry, Ms. Barton and Mr. Germaux. I said I’d do something and I didn’t deliver. The “irresponsible” in the blog title is supposed to mean that I read whatever, with only a regard for what catches my eye, not in an effort to better myself or be literary or live up to whatever standard — it’s not supposed to be an ethic. This is a very frustrating case for Daniel and his squad. 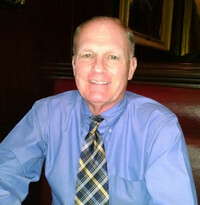 There are multiple victims who appear to have almost nothing in common, and although the killer leaves a “clue” at each crime scene, those clues likewise appear to be completely disconnected from each other. It’s only through hard work and determination that Daniel and his colleagues eventually realize that they need to change their focus in order to catch the killer. Since One by One is your follow-up novel to Small Talk, what new character developments can readers expect from main character Daniel Hayes and his team? We learn more about Daniel’s previous life as a professional athlete, and we meet a journalist who covered Daniel in that life, a man whose skills Daniel calls upon to assist the police in their hunt for the killer. In addition, we follow Daniel’s developing relationship with bookstore owner Lauren Cavanaugh. I thoroughly enjoyed the dual POV in Small Talk. I loved how you got inside the killer’s head. Can readers expect something similar in One by One? In Small Talk, Daniel and his squad had an idea who their killer was fairly early on in the case. The problem they faced was proving their suspect was actually the killer. Thus, a major part of the plotline in that book involved the way Daniel and the killer interacted with each other, which is why I used the killer’s POV occasionally. 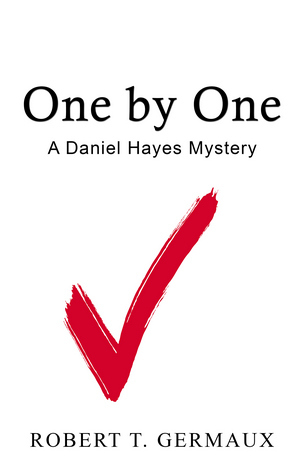 In One by One, though, the squad has no idea who their killer is until near the end of the story, so the emphasis is on the hunt for that person as opposed to any interactions the killer has with Daniel. Everywhere! It doesn’t take much to ignite a spark in my fertile imagination. Sometimes I have to do a lot of research, as was the case with both Small Talk and One by One, because to the best of my knowledge, my social circle has never included any serial killers. 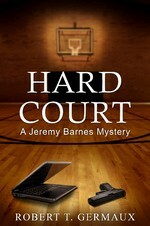 But in Leaving the LAW, a Jeremy Barnes novel I’ll be releasing in the future, I relied heavily on my experiences teaching in an inner-city Pittsburgh high school that the police called Gang Central. What do you think makes a good suspenseful mystery? The answer, in part, lies in your question. Suspense. I like to read books that keep me guessing. Along with that, I think readers have to be involved with the characters in a novel, to care about what happens to those characters, even the bad ones. I want the good guys to win and the bad guys to lose. Ellen Tishler was killed in her home in Hampton Township, about twelve miles north of Pittsburgh, but still within Allegheny County. My team works out of Zone 3 in the city, so in the normal course of events, we wouldn’t have had anything to do with the case. We were called in because the chief of police in Hampton thought it might be something SAS should be handling. The chief’s name was Benjamin Roberts. He was a shade under six feet, with dark hair cut very short and the beginnings of a little potbelly, but still in good shape for a guy chasing sixty. His uniform was neat and clean, his tie perfectly knotted, his shoes spit-shined. Ex-military, I was guessing. Roberts had a reputation for being old school all the way. He even conducted inspections at the start of most shifts. He also had a reputation as one of the sharpest cops in the county. It was three o’clock on a sunny September afternoon when Henry and I arrived at the two-story brick colonial on Edgerton Drive in the upper-middle class neighborhood. The chief greeted us at the door. Roberts nodded at Henry, then motioned for us to enter the house. “You’re not,” I said. The three of us were standing in a small foyer. I could hear people talking and moving around in what I assumed was the living room, down the short hallway and to the left. “Yeah,” he said. “Crime scene’s got kind of a weird look to it. My department doesn’t handle many major crimes, but I’m pretty sure this isn’t your run-of-the-mill homicide. Anyway, c’mon in and have a look.” He led us down the hall and around the corner, and Henry and I got our first look at Ellen. If it wasn’t for the small hole in the middle of her forehead, it would have been easy to assume that she had simply dozed off while reading that month’s issue of Beautiful Homes, which was lying on the floor next to the large floral-patterned wingchair. Ellen was slumped in the chair, her head tilted to one side, her right hand dangling over the armrest. Her eyes were closed, and there was no noticeable blood. “So no shell casings,” I said. Henry and I stood for a minute to take in the scene. Ellen appeared to be in her mid-to-late seventies. She was wearing an expensive-looking dark green pants suit, with low-heeled brown shoes. Her white hair was nicely coiffed, as though she’d recently been to a salon, and there was a string of pearls around her neck. I doubted if this was how she dressed for an afternoon at home. “Who found the body?” I said. “Ms. Cloakley still around?” asked Henry. Roberts nodded towards the back of the house. He’d been carrying a large plastic evidence bag, and now he held it up for Henry and me to see. “We found this on the body. 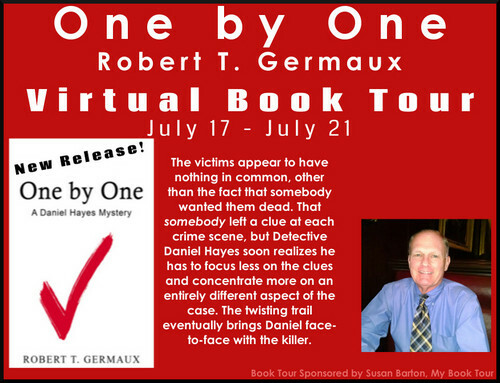 Welcome to the One by One by Robert Germaux Book Tour stop here at The Irresponsible Reader. 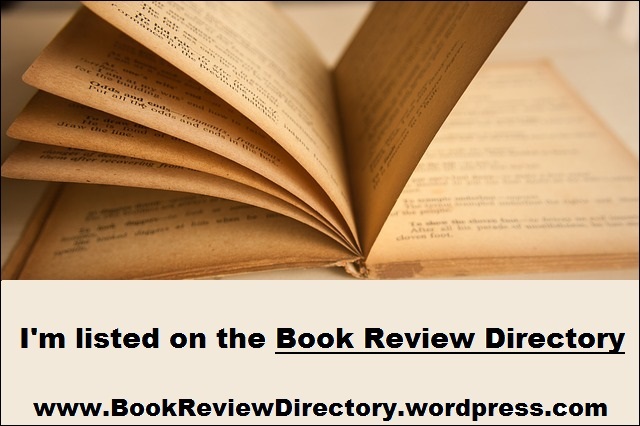 We’ve got this spotlight post here, and coming up over the next few hours, we’ve got a nice little excerpt from the book, an interview with Robert Germaux, then my own take on the book, and finally we’ll have a way to enter a giveaway for the book! (the links will work once the posts go live). 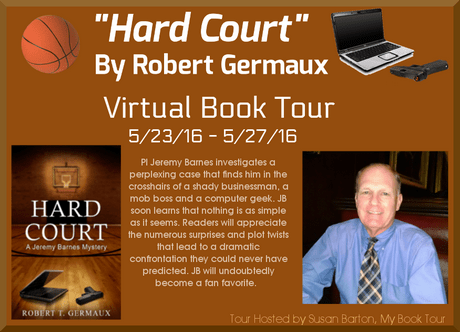 Thanks to Robert Germaux and My Book Tour, I have a Kindle version of Hard Court to give away!